Summerlin dentist, Dr. James Polley welcomes you to our website and invite you to take a look around and see if what we have to offer makes sense to you. As you learn more about who we are and what we have to offer as a dentist we would like you to keep in mind that the underlying purpose of everything we do is to help each person we serve to be happier, healthier and more likely to succeed than before we met. To us, dentistry is more than fillings and crowns. It is an opportunity to meet and care for wonderful people who need our help to be their best selves. We look forward to meeting you and welcoming you to our dental practice. We invite you to contact our Summerlin, Las Vegas office today. Are you unhappy with the appearance of your smile? If so, then a Summerlin dentist can help. It doesn’t matter whether you have discolored teeth, crooked teeth, or even missing teeth: a dentist can give you the smile you dreamed of. Summerlin dentist, Dr. James B. Polley has years of experience helping people just like you get a healthier, more beautiful smile than they ever thought possible. He uses some of the most advanced technology and tools available to make procedures comfortable and convenient while ensuring the best results. And Dr. Polley is among the most highly trained Summerlin dentists in the Las Vegas, NV area, with over 20 years of study at the elite and exclusive Kois Center. Dr. Polley was named first a Mentor, then a Clinical Instructor, the highest rank available to a cosmetic dentist who is not in a specialty area. We invite you to take advantage of our commitment to you by contacting our Summerlin Las Vegas dental office today! Located in the heart of Summerlin, our Las Vegas dentist office is convenient to the entire Las Vegas area. Are you looking for a cosmetic dentist who combines advanced training with extensive experience? As an experienced general and cosmetic dentist, Dr. Polley will never compromise oral function and quality dental work for cosmetic enhancements. Instead, he will maintain the integrity of your smile and preserve your natural tooth structure as much as possible. With a beautiful smile on a solid foundation, you can look forward to enjoying your new image for years to come. Want to learn how our dentist can help you? Please call (702) 873-0324 or email Dr. James B. Polley in Summerlin, Las Vegas for an appointment. These days, a cosmetic dentist has many tools to give you a straighter, whiter, more beautiful smile in just a few appointments. Here are some brief descriptions of some of the more popular procedures we offer. Teeth whitening uses custom-made trays that fit precisely over your teeth and professional-strength whitening compounds to achieve whitening results that are more significant and even than you get with over-the-counter treatments. Porcelain veneers are versatile cosmetic dentistry treatments that can completely reshape your smile and conceal discoloration that is resistant to teeth whitening. Invisalign uses clear plastic aligners to straighten your teeth instead of the metal brackets and wires of traditional braces. People like the comfort, convenience, and ability to keep eating all their favorite foods with Invisalign. We often combine it with other cosmetic procedures to achieve a smile makeover. Dental implants are the best tooth-replacement option available. They replace both the crown and root of your tooth so you get a replacement tooth that is as attractive and fully functional as your natural tooth. With proper care, dental implants can last a lifetime. A Smile Makeover is a combination of procedures designed to give you the beautiful smile you desire. During your consultation, your cosmetic dentist will listen to your concerns and goals and will offer suggestions about which procedures might be best for achieving the results you want. 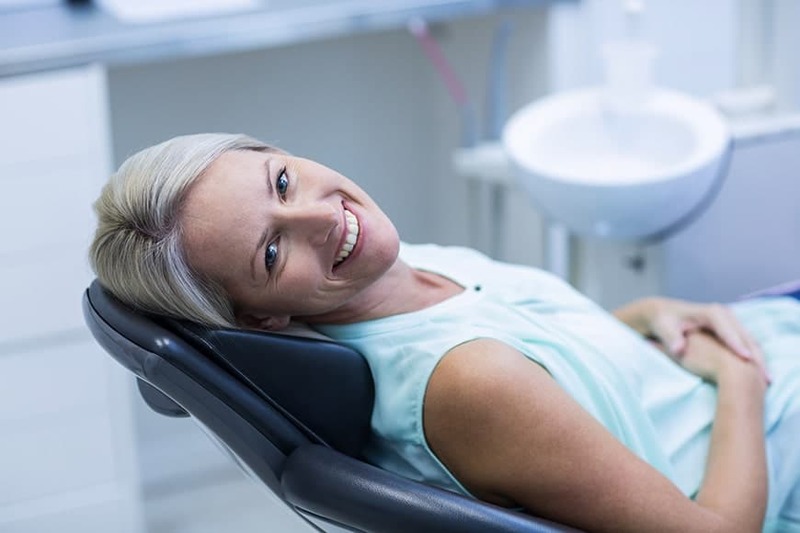 We are also highly concerned with the comfort of our dental patients, including those whose dental anxiety makes it hard for them to feel relaxed at the dentist or even make their dental appointments. We offer sedation dentistry to ease comfort, including general anesthesia for people who don’t respond to traditional sedation or who need extensive treatment. Why Do I Have a Bad Taste in My Mouth? April 18th, 2019|Comments Off on Why Do I Have a Bad Taste in My Mouth? April 8th, 2019|Comments Off on Is Sedation Dentistry Right for Me?